The images below are from Sonja Lauren’s past dental records. A portion of Sonja’s dental records from 11/26/75, before her teeth were extracted. Highlighted area reads: "Dr._____ said that situation hopeless — (agree)." 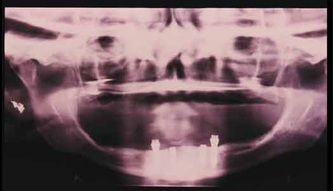 Radiograph of Sonja’s mouth before her natural teeth were extracted. The third molars (wisdom teeth) had not erupted into the mouth. 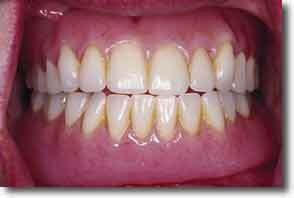 The crowns of all the natural teeth are extensively affected by dental decay. However, the roots of the teeth and the bone level on the roots appear excellent. 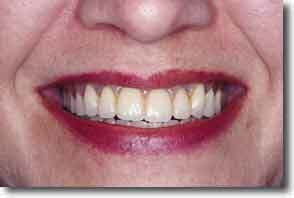 Some or all of the teeth could have been maintained by extensive and expensive dental procedures. 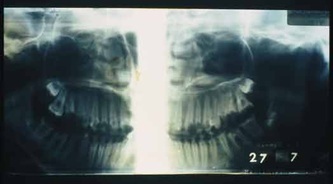 Radiograph of Sonja’s mouth approximately 25 years after the natural teeth were extracted. 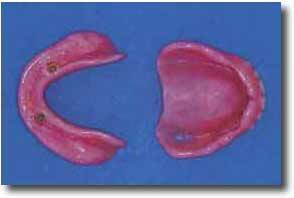 The bone which surrounded the natural teeth (alveolar bone) has resorbed, which is a natural sequel to tooth loss, leaving the basilar bone of the upper (maxilla) and lower (mandible) jaws. The posterior ridge of the lower jaw has been increased in height by surgically placing an artificial bone substitute (hydroxylapatite). 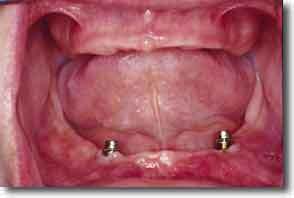 Four endosseous dental implants have been surgically placed in the bone at the extension of the lower jaw. Attachments to supplement the retention and stability of the lower complete denture project into the mouth from two of the implants. The other two implants are submerged below the top of the ridge. Sonja’s mouth illustrating healthy edentulous ridges and the attachments on the two implants. Three top (occlusal) view of Sonja’s upper and lower denture. The bottom (tissue surface) view of Sonja’s upper and lower denture. Note the retentive devise of the two attachments imbedded in the denture surface. 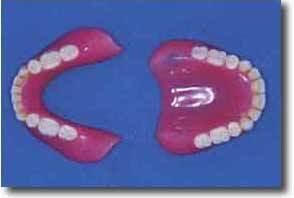 The upper and lower dentures in Sonja’s mouth.